Nice post! The kids look cute with their matching gear. =) It's great to know that there is a new generation of lightweight backpackers/bikers growing out there. Looks like a great time with the kids. I wish more people would take the time to get their kids out into the backcountry. Very nice! Really enjoyed this post. The Teijo/Mathildedal area has been on my list of places to visit; now even more so. The North Face Blue Ridge: Max height 150 cm, weight 1100 g.
Ajungilak kompakt 3-Season: Max height 165 cm, weight a horrible 1300 g.
Both bags are good to just below freezing, but are of course too heavy (my own down bag for similar temperatures weighs 600 g in size XL). A couple of years from now I will probably get them proper down bags or quilts. Thanks for your reply. It really seems that there are no really good alternatives. What I have been thinking is that I could purchase a quilt (which would be good to around 0 C). 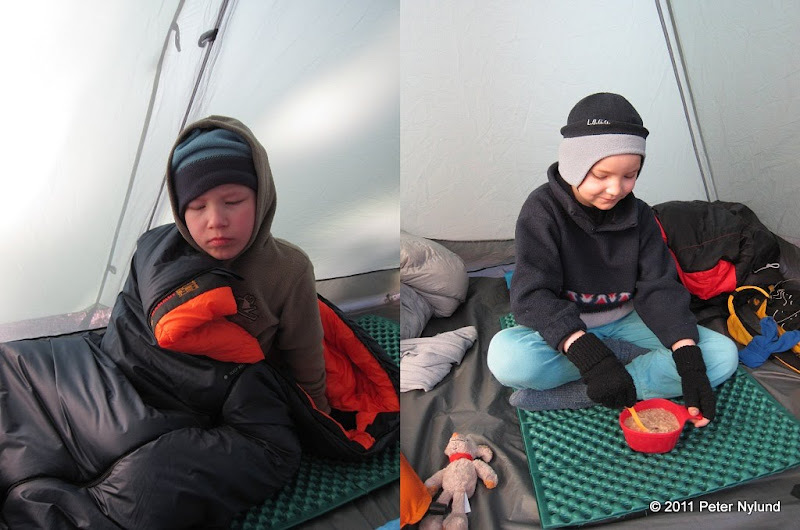 Then I could use it with my down sleeping bag in the winter (it should be ok to -7 C, but I freeze easily), and from late spring to early autumn it would serve the kids (of course, one at a time - or me, and the kids would use my sleeping bag). It would also be nice for me when it's really warm (maybe July?). Nice Post! Really waiting new post from your Golite Shangri-La 5 tent. I also searching something similar; lightweight and more space. Great. We spent a number of nights too with kids at Mathildendal. BTW family trips - and they make about half of all trips I do - is one use case when I do not care about gear weight. I'm carrying almost everything myself anyway, and I'm not the "performance bottleneck". So no reason to compromise on comfort or to spend extra $$ to shed 200g. Thanks for the comments. I'll try to make the tent post during next week. Konstantin, I think whether you can stay at the same place as another group really depends on the situation. Teerisaari, at the south of Puolakkajärvi is big enough to accomodate several groups. We were some 30 m from the other group behind the shelter they stayed at. And it is the kind of place where I don't think anyone can demand to be "alone" at. In my opinion this goes for most of the official places intended for camping. Camping in another place using the everyman's right might be different, though. But if it is the only reasonable place within the area I think most people would accept other groups at the same place. I don't obsess about weight, but when buying anything new I do try to find the lightest alternative, though cost is also a parameter. And while it does not matter much if you are only walking a few hours, I think for a slightly longer family trip weight does matter, since it is clear who has to carry it. Nice post. I can't wait to get out with my son. He has been sleeping in a small play tent at night at home for a while and i think he would enjoy such explorations as what you describe very much. And so would I. Re. sleeping bag. -- We have a Haglöf Slumber Toddler bag (http://www.haglofs.com/en-us/products/sleeping-bags/1-season/unisex/slumber_toddler_en-us.aspx). It packs small and is fairly light. He is now tree years old and last summer it was warm enough for him waring cheap wool/cotton base layer and iirc a wool sweater. The biggest issue was to keep him in the bag while sleeping. He had a tendency to worm his way out. I'm curious how he will sleep this year wrt that. The length is only 110 cm. That seams quite small but according to a crow-chart (like this http://www.netdoktor.dk/images/ppcdk889423000_drenge_hoejde_alder_0-7_400.gif) he can fit it two summers more. That will be four summers all together. And at some points his little brother (emerging this summer) will inherit it. If one find this route silly, what most folks do is to use a junior bag and fold the foot box over the legs of the kid and tie it such that it doesn't slide down again. In that way one limit the extra room the kid need to heat and the bag can be used for a longer time. Re. the your kids backpack. -- What is it? Btw. It's quite hard to get to comment on your blog. I had to make a blogger account for my g-spam-mail account. The backpacks are some sort of small multisport rucksacks of about 8 l capacity, Halti Airlite 1, bought on a local sale. There is no greater thought behind them, they were just light, cheap and suitably sized. Earlier the kids have slept on full length pads, but since I make do with a short pad despite my 192 cm I thought the kids could as well, but I was wrong. They obviously move around a lot when sleeping. The Z-Rest is not really a slippery sleeping pad. Regarding the comment, to avoid spam I don't allow anomynous comments, just like most bloggers. Your pictures are awesome again...really they are something special. Thanks again!